Young Merlin, triumphant after his first encounter with the dreaded Rhita Gawr, has brought new hope to Fincayra, the enchanted isle that lies between earth and sky. Yet when a renewed tide of evil arises, its first victim is Merlin's own mother. To save her, Merlin and the forest girl Rhia must follow the perilous path of Seven Songs of Wizardry that has claimed even the lives of great wizards. Most difficult of all, Merlin must discover the secret of seeing not with his eyes, but with his heart.The eagerly anticipated second book in The Lost Years of Merlin epic combines all the passion, power, and spiritual depth that are T.A. Barron's hallmarks. 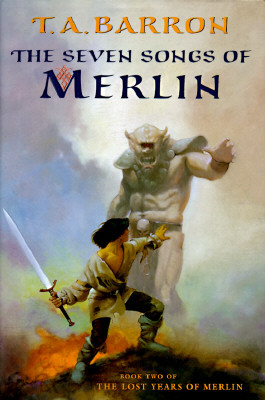 It adds a thrilling new dimension to the legend of Merlin, even as it offers lasting inspiration to us all.